A quick note about salt water taffy. I’m not against it, I just don’t think it’s a Utah thing. It came from boardwalks in New Jersey. Candy stores in Utah have added their twist on it, and they produce a lot of it, but here is a candy Utahns can claim: the chocolate cinnamon bear. If you don’t know what a cinnamon bear is, they’re about four times the size of gummy bear. They have a more waxy consistency. They're good, and in my opinion, they taste even better covered in chocolate. That's a lesson I learned as a student at Brigham Young University. At the BYU Bookstore, in the heart of campus, is a very prominent pile of chocolate cinnamon bears. They come in 1 pound bags and, according to the staff, they have to be restocked twice a day — sometimes more during the holidays. Hanging around there for a bit, I chatted with people like Kieran Bennett, a sophomore from Lethbridge, Canada. He says you can't find chocolate cinnamon bears in Canada, so he's been tasked to bring home four bags for his mother. 'Enrobing' is just a fancy word for being drenched in chocolate. This was the story for most people at the bookstore that day — visitors who hailed from Maine, Virginia and Sacramento. Friends and family had discovered the chocolate cinnamon bears here, couldn’t find them where they lived and sent someone on an errand. Despite the BYU packaging, this isn’t where the bears come from. 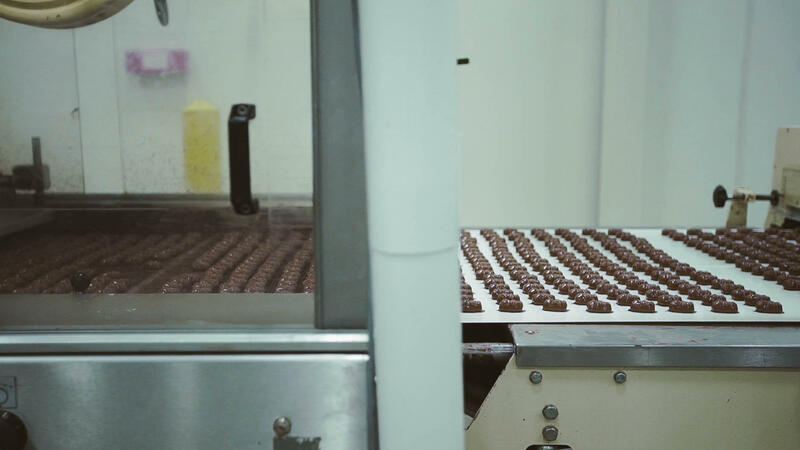 To see where the magic happens, you have to travel up the road to Sweet’s Candy Factory in Salt Lake City. It's a massive warehouse — not unlike Willy Wonka's — with rooms dedicated to each other products: the taffy room, which was very warm; the jelly bean room, which was filled with colorful powder; and the chocolate enrobing room, where it all began. A factory worker preps cinnamon bears for their chocolate "enrobing." "Enrobing" is just a fancy word for being drenched in chocolate. The cinnamon bears are carried along a conveyor belt that is nearly as long as a football field. They get covered by a small chocolate waterfall and then the rest of their journey is spent being cooled to just the right temperature. They’re scooped up by the hundreds, ready to be bagged. My tour guide was Rachel Sweet. Yep, it's a family name. 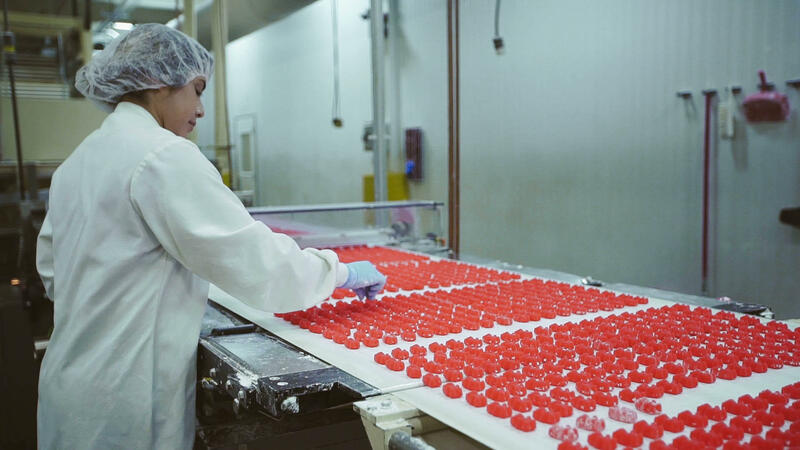 The Sweet's have been making candy since the late 1800s and have been headquartered in Salt Lake City for over 100 years. 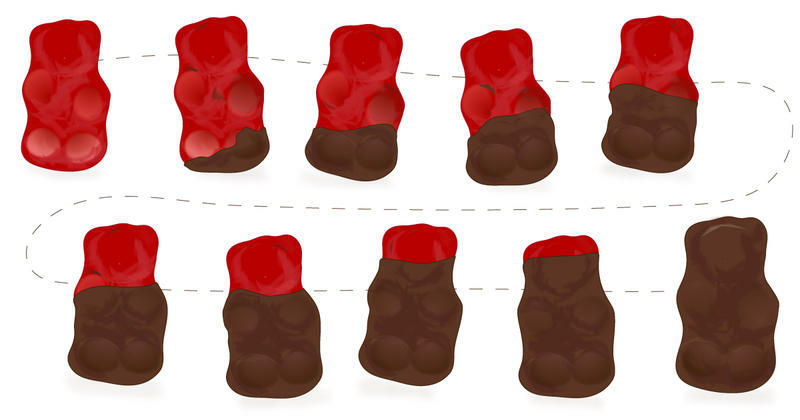 Sweet said that one "enrobing cycle" will produce about 20,000 pounds of chocolate cinnamon bears. In a year Sweet’s will produce nearly 1 million pounds of these bears which, according to company president Richard Kay, is barely keeping up with demand. Cinnamon bears are covered in chocolate and then cooled for packaging. Kay says over the years they’ve tried all sorts of things. From taffy (really messy) to potato chips, bacon, cherry sours. Not all of them stick, but the cinnamon bear did and they started producing them for bulk retailers back in 1994. It is an "interesting combination" - and it has it's skeptics. But, eventually, people are usually won over. In a taste test at KUER studios, some of the reporters had mixed feelings about their first bear. Managing Editor and, as of now, budding food critic, Julia Ritchey, said she liked the chocolate but wasn't a fan of the cinnamon. But it wasn't long before she and the others were reaching for another. This didn’t surprise me. I wasn’t convinced right away either. It’s an acquired taste. Much like - and I know this is a stretch - the candy’s home state. It might take a little getting used to. But, once it clicks, people keep coming back for more. Like the chocolate cinnamon bears, Utah is a distinct place unlike any other, both culturally and geographically. It might take a little getting used to. But, once it clicks, people keep coming back for more. I think Utahns should be proud of their state and proud of the chocolate cinnamon bear. It’s as unique a candy as you can find and it's all the better for it. 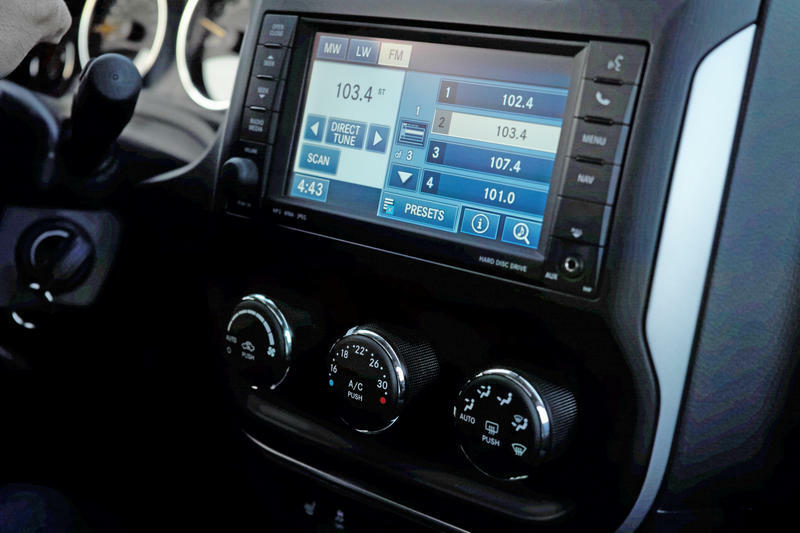 Fans of Brigham Young University’s Classical 89 will have to say goodbye to the station next June. The university is shaking up it’s programing in favor of self-produced content. 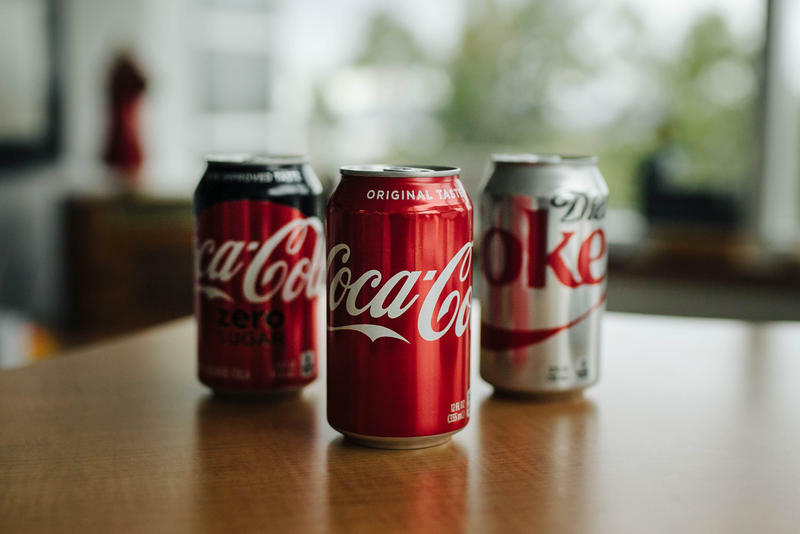 For over 50 years if you wanted to get a caffeinated soda on Brigham Young University campus in Provo, you were out of luck. Until now.